It is perhaps tempting to think it might be easier to do nothing rather than to take steps to address some of these threats. Take for example the issue of extreme fluctuations in water levels and the grave concerns expressed by many residents and other stakeholders recently when Georgian Bay and Lake Huron hit – and stayed at – unbelievable historic lows for such an extended period of time. But there is often an economic cost associated with not taking action, and sometimes that cost can end up to be considerably more than expected. To better understand and quantify the economic costs associated with sustained low water levels, Georgian Bay Forever recently worked with the University of Toronto’s Mowat Centre and the Council of the Great Lakes Region to determine how key sectors of the Great Lakes St. Lawrence Region’s economy would be affected. Mowat’s research team looked at the major financial losses associated with the destruction of historic wetlands resulting from sustained worst-case lower water levels, as well as changes to water quality and biodiversity. The scientists also considered the costs of remedial measures such as dredging, blasting, and shoreline fortifications. 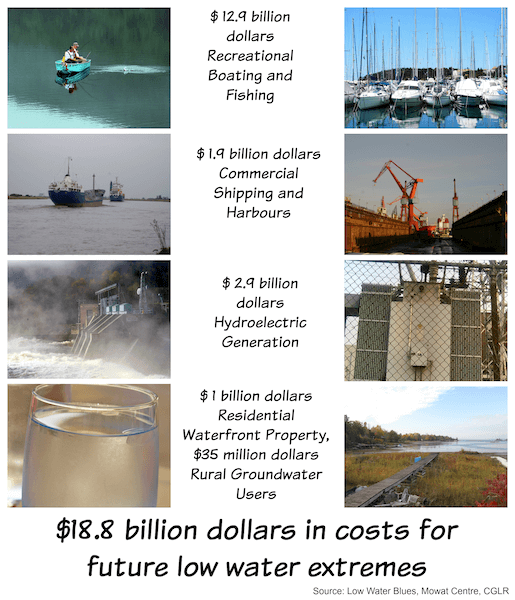 Additionally, the impact on specific economic sectors deemed to be those most critical to the future prosperity of the Great Lakes Region was assessed, including effects on the shipping and transportation industry; recreational fishing, boating and tourism; residential waterfront properties and related property values; hydroelectric power generation; and, municipal and industrial users. Their conclusion? The cost of doing nothing is not affordable. To not mitigate the impact of sustained low water levels now in these areas will lead to a shocking USD $9.61 billion by 2030 and to USD$18.82 billion (both converted to present value dollars) by 2050 in direct hard costs for the Great Lakes Region economy. Further, these amounts are considered to be very conservative estimates. Indirect soft costs such as job losses, productivity losses, and impacts on additional economic sectors or secondary and downstream sectors were not included in these economic calculations. If both direct and indirect economic impacts were to be included, it is anticipated that the multiplier effects would likely cause the costs to increase by a factor of at least three or more above these preliminary estimates. The shipping industry would experience increased costs due to the need to carry lighter loads in order to provide sufficient under-keel clearance and to avoid the risk of grounding. These costs would be passed on to manufacturers and industries that rely on this relatively inexpensive method of transportation. For many customers waterborne transport is the only economically viable means of transportation in the Region. Some 322 million metric tons of cargo were shipped in 2010 along the 3,700 km of waterways, and through the 15 international and 50 regional ports that make up the busy Great Lakes St. Lawrence Seaway system. A vibrant, multi-billion dollar sector and one of the Region’s major growth opportunities, the industry serving recreational boaters, anglers and tourists could face lower catches due to increasing numbers of fish dying as a result of degraded or declining habitats. A full 80% of sport fishing species need wetlands and streams to spawn. Boaters might not be able to access slips, boat launches, lakes and waterways, and these vessels could also risk grounding or becoming stranded, leading to issues with boating safety. There are over 5 million boats registered on the Upper Great Lakes. Tourists might not be as enthusiastic about visiting the area either if it could no longer live up to its image as a pristine, water-focused tourism destination with beautiful beaches and views. Some 73 million tourists visited in 2010, contributing $12.3 billion in spending to regional coffers. Marinas, hotels, resorts and other downstream businesses would be hit especially hard if these visitors stayed away. Owners of residential waterfront properties in Ontario, including year-round homes, second homes and seasonal recreational properties which were valued at over $28.5 billion in 2012, could find their property values plummet as they find themselves vulnerable to losing their water access and finding their boat launches, docks and piers high and dry. Residential properties on the shores of Lake Huron represent almost 68% of the province’s total number of waterfront properties. During the recent spate of years with extremely low water levels, Georgian Bay owners saw a 25% drop in property values, an indication of what the future might hold. Water access and good waterfront views are a key measure of property value when it comes to waterfront real estate. Property owners may also find they face increased costs for repair and replacement of piers, boat launches and other infrastructure suffering from dry rot. Hydroelectric power plants may experience reduced production due to decreased river flow and reservoir levels. The region’s most prominent and cheapest source of environmentally sustainable, renewable energy, these power generators could lose their flexibility to respond quickly to short-term shifts in energy demand. If they are forced to cease operations and replace lost production with energy from other, more expensive or less environmentally friendly, sources, both energy costs and emissions could increase. Not to mention the cost and risks of decommissioning existing power plants. Municipal and industrial users rely heavily on access to an ample supply of clean water. Municipalities need to supply tens of millions of residents with safe and reliable drinking water on a daily basis. If bacteria-producing algae or other vegetation contaminate the water, public health risks will increase, as will costs. The vast agricultural industry in the region relies on the Great Lakes basin for irrigation, with a full 95% of Ontario’s farmland located here. Industrial sectors at the heart of the regional economy rely on water as an essential operational input. Industries such as food processing, petroleum refining, pulp and paper, chemical manufacturing, steelmaking, mining, nuclear power generation and a wide variety of other manufacturers require a supply of water for their production processes. If water is no longer available in the quantities or quality required, all of these industries could be at risk of downsizing, closure or relocation, affecting local spending, taxes, jobs and downstream service businesses.